Portland, Ore. – September 29, 2011 – The USDA’s newly released MyPlate icon recommends that Americans fill half the plate with fruits and vegetables at every meal, and with versatile USA Pears, it’s pearfectly easy. Delicious in recipes both savory and sweet, USA Pears pair well with proteins, such as chicken or pork; grains like wild rice; and vegetables from acorn squash to zucchini. The growers of USA Pears offer the following tasty tips to include fresh, sweet, and juicy pears in your meals to fit the MyPlate recommendations, whether your meal is a smoothie, boxed lunch, or savory spread – think outside the plate! 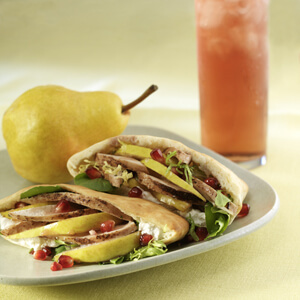 Add pear slices to sandwiches, quesadillas, and paninis for a sweet burst of flavor. Dice pears and mix into homemade salsa, stir-fry, or wild rice. Puree ripe pears and cooked pumpkin or other winter squash, such as acorn or butternut, and serve as a savory accompaniment to pork or chicken. Top sliced celery with nut butter and pear pieces for a kid-friendly snack. Slide pear chunks and chicken onto skewers and grill, or skewer pears with other cubed fruit to end meals with a sweet treat. Perfect in lunchboxes for school or work, this sandwich packs a lot of flavor in a pita. Crisp greens, grilled chicken, sweet pears and tangy goat cheese combine in a convenient bread pocket to fit the MyPlate guidelines in one handy package. Combine olive oil, pomegranate syrup, salt and pepper. Reserve ¼ cup for drizzling on sandwiches. Preheat grill to medium heat. Brush cut side of pears with pomegranate vinaigrette. Grill cut side down until lightly grill-marked, about 5 minutes. Cool. Slice thin. Place chicken in a dish with remaining vinaigrette. Turn to coat. Remove from vinaigrette and grill on medium heat, 6–7 minutes until lightly grill-marked. Turn. Brush with remaining vinaigrette in dish. Cook 6 minutes or until internal temperature is 170 degrees. Cool. Slice thin. Cut pocket breads in half. Fill halves with sliced chicken, pears, goat cheese and greens. Drizzle with reserved vinaigrette and garnish with pomegranate seeds. Additional recipes and serving suggestions can be found online at www.usapears.org. The Pear Bureau Northwest was established in 1931 as a nonprofit marketing organization to promote the fresh pears grown in Oregon and Washington. Today, the United States is the third largest pear-producing country in the world, and Oregon and Washington comprise the nation’s largest pear growing region with 1,600 growers producing 84% of all fresh pears grown in the United States. Pears grown in these two Pacific Northwest states are distributed under the “USA Pears” brand. Pears are an excellent source of fiber (24% DV) and a good source of vitamin C (10% DV) for only 100 calories per medium-sized pear. Sweet and juicy with no fat, no sodium, and no cholesterol, pears are a perfect choice for a snack as well as for any course of any meal of the day. To learn more and to find culinary insPEARation, visit www.usapears.org, and follow USA Pears on Facebook at www.facebook.com/usapears and Twitter @USApears.